– Temple of Apollo (Ancient Corinth) – built in the 7th century. Originally it had a total of 38 columns. Only 7 of them remain today. – Amphora – Achilles slaying Penthesilea, signed by Exekias, c. 530 BCE; It is now stored in the British Museum, London. I’m in Athens and spotted that one yesterday! 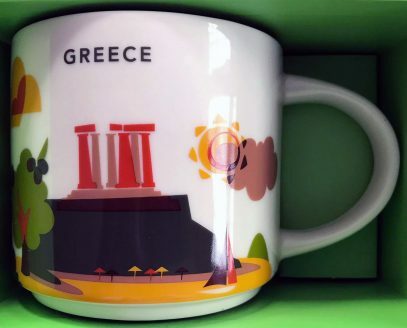 I totally agree with your comparison to the Germany mug…but I bought it either way for my collection.